Czech documentaries seem to be responding to changing times faster than Czech feature films. Documentarists have never lost touch with contemporary life, not even after the political changes in their country in 1989. They know very well what they want to shoot and for whom. True to say, authors of Czech feature films were long accustomed to turning to the past which offered much safer subjects than the present. Under the former Communist regime, films about the past had a better chance of escaping the censor’s attention. Yet, preoccupation with the past seems to have persisted to this day. What was called the new wave of Czech film in the late ’60s (Milos Forman, Ivan Passer, Vojtich Jasny, Jirí Menzel, Vera Chytilová) earned its name from personal, ironic stories from everyday life. Those directors were in the habit of selecting ordinary heroes, and their sympathies lay with the small, neglected and oppressed people. 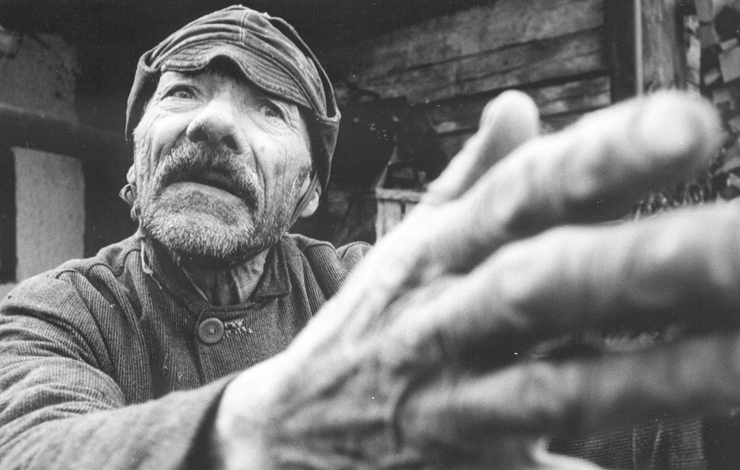 It seems that the old villager in Forman’s Firemen's Ball (1967), who just had his house gutted by fire and who is left with only half of his bed in a snow-covered country, has influenced the paths of Czech film more than all the communist guidelines. Czech documentaries are highly local in their subject matter, and distinctly European in their social sympathy. It was Forman himself who personally introduced Miroslav Janek's documentary The Unseen (1996) at the World Film Festival in Montreal in 1997. Beginning his career as an amateur filmmaker in 1980, Janek emigrated to the United States, where he edited or shot documentaries. He returned to his native country after 1989. His documentary is set in a Prague boarding school for blind children. A group of kids is engaged in photography, making pictures of objects they had previously touched or objects that give out some sound. They work with cheap cameras and their pictures are far from perfect. Initially, the project ran up against great difficulties as some people thought it a stupid idea to photograph blind kids. But Janek was primarily concerned with making a film about enthusiasm and the joy of life. The camera here does not work as an instrument for making pictures, but rather serves as a link between blind children and the “normal” world. The kids do their best to be like ordinary people. Forman regards Janek's film as very significant. Two years later, Janek shot another documentary about blind children, called Hamsa Is My Name, portraying children who pursue special hobbies. These are mostly musicians and singers who attend the Prague conservatory for the blind. Others write poetry, one blind youth is an authority on military battles, another opened his own tea-room at a hostel for physically handicapped children. “Listening to music, I can imagine colors,” says an attractive blind girl in the film. Human voice conveys to the blind messages which are more profound than those we are accustomed to receiving in the so-called normal world. The blind judge the character of the people they meet from their voices. Janek emphasizes that his films about the blind are meant for ordinary viewers. “Most people do not know how to behave towards the blind. I wanted to open up that world and show that these are ordinary people with everyday worries,” says the director. Janek also shot a documentary about village musicians Previanti (1999). This film harks back to an earlier documentary made in 1972 by Dusan Hanák, a founding father of Slovak cinematography, and entitled Pictures Of The Old World. Hanák portrayed the way of life of ten elderly people who live at the edge of society. In contrast to Frederick Wiseman’s Near Death where terminally ill patients don’t seem to be alone, Hanák's old people are definitely lonely. His vision is much less documentarist and much more poetic. His documentary portraits of the old people are conceived as painter's canvases. No wonder then that the set designer for that film was the well-known Czech author of animated films Jan Svankmajer. Janek also shows his village musicians as loners. These are people who do not seem to fit into the present-day world. They are out of tune with its rhythm. One of the figures is a harmonica-player who carries her instrument from one village to another on a cart or on a children’s sleigh in winter. The only moment Janek's protagonists are together with other people comes at a village dance. Then they return to their empty homes. Indeed, the tradition of loneliness in Czech films has deep roots. An explanation of the origin of loneliness in Czech cinematography may be found in the lifestyle of older village (and not only rural) people. They are accustomed to living alone without any communication infrastructure whatsoever. A collective way of life is more common in Bohemia among young people and in the Roma community where one man is dependent on another. Paradoxically, the higher the civilization standards the greater the loneliness. It is no accident that Janek's younger colleague and actor Bretislav Rychlík who, as a “naturshchik,” has become a major figure on the Czech avant-garde stage in the ’80s. Rychlík shot a documentary called One Year about several very old inhabitants in a remote village in Moravia's White Carpathian Mountains. In actual fact, the film was shot by accident. “I used to pass those people when riding my bike, and they seemed to me so very old that I always wondered whether they were still alive,” says Rychlík. Some of the people appearing in his documentary died during or soon after the shooting. In Rychlík's eyes, these people have their own strength. “We have grown accustomed to living in affluence and to throwing away what we no longer need. We have cars and central heating. Still, we constantly feel we are lacking something, and we want more. People in my film have to be content with little. In the morning they have to light their stoves, feed their rabbits and cut grass with a scythe. They buy only basic food. And yet their human dignity is greater than that we usually encounter in what are known as modern people.” One old man has a single aspiration: every time he goes to bed he wants to survive the night and live to see the next dawn. Another man has already had four heart attacks, another is immobile and goes shopping in a tricycle he had made himself. Their children come to visit them very rarely. Their companions are dogs and nature. Their houses are dilapidated because they no longer have the strength to repair them. Yet they live. People who are usually forgotten tend to reappear in Czech documentaries time and again. And the viewers of such films also differ from the mainstream of Czech cinema-goers. The state-owned television or film festivals are virtually the only distribution channels for such documentaries. For example, a film by Miroslav Janek was seen only by 120,000 people, as the remaining several million TV viewers were watching a live transmission of a concert given by the pop group “The Kelly Family.” It is interesting to note that this particular distribution channel still survives, attracting a stable circle of viewers, and its popularity has not slumped over the past ten years. This “underdog” approach is used in Czech documentaries also in the case of other social groups. The outstanding documentary by the Croatian filmmaker Andrea Maistrovich (I Am Afraid Of You, Dear World, 1998), shot in Prague, is about drug addicts, about people who are pushed to the edge of society out of fear. If so-called ordinary citizens realized that a drug addict is basically just the same as themselves, they would also inevitably have to admit that there is a piece of a drug addict in each of us. If there is anything Czech documentarists find particularly strange, it is playing at stardom. Their documentaries on famous people invariably contain something that manages to strip them of their aura of fame. Indeed, that is a common Czech approach to the subject. Fame is all right as long as it is presented in passing, or in a homey fashion. That is also why Czech celebrities usually behave very modestly, as commanded by the local custom. A case in point is the film by the Serbian-born Mira Erdevichki called Black-And-White In Color (1999). This portrays the Czech Roma singer Vera Bílá. Erdevichki studied in Belgrade and later in Prague where she worked as a radio speaker and TV reporter and shortly as a professional handball player. Rather than a portrait of a star, this documentary is about the life of the Roma community in the town of Rokycany, some sixty kilometers southwest of Prague. It traces the career of the singer away from the concert stage, as she looks after family, following her even to a local pawn shop where Bílá has to sell things to feed her family. The film ends with her famous concert in Paris but its purpose is to show that the Roma community and its lifestyle really is not a matter of course. Erdevichki remains kind-hearted even when describing an official investigation of Vera Bílá's alleged abuse of a state housing support scheme. This reminds me of the Canadian documentary John Paskievich shot in the gypsy slums in the ghetto on the outskirts of the Slovak village of Svinia, Gypsies from Svinia (1998). Paskievich records the squalor of gypsy life, the mutual hatred between the two communities and the shocking conditions the Romas live in. His camera shows people sleeping on the ground, with rats and worms gnawing at the remnants of their food. The author goes on to take the story to its political conclusion by asking whether this community has any chance of survival at all when nobody wants to employ Romas, when they eat bad food and drink contaminated water, build their houses of sticks and mud and simply have no money to buy a flat which is no longer provided by the state but which has to be bought for some 30,000 US dollars. Paskievich's documentary prompted officials of three international humanitarian organizations to come to Svinia to investigate. For instance, the Heifer Project discussed ways of helping the Romas in raising domestic animals, a plan that could offer them a chance for survival. On the other hand, Czech perception almost never reaches such critical heights. Interestingly, gripping documentaries on the life of youth prostitutes and the Czech homosexual pornographic scene were shot by a Pole, Wiktor Grodecki, who lives alternately in Los Angeles and London. His films Not Angels But Angels (1994) and Body Without Soul (1995) had a tough ride in Bohemia, scoring much success abroad than in the Czech Republic. Czech critics complained that his films were too harsh and recommended him to shoot similar documentaries in Poland or the United States. But there are no such stories from the pornographic underworld by Czech documentarists. Indeed, the habit of taking a more or less lyric approach and of perceiving films as lyricism or a poem is deep-rooted in the country. Such an approach is sometimes beneficial, sometimes not. I have always noticed at various film festivals that theaters were packed when showing American documentaries revealing the hidden side of political life. For instance, the compelling documentary The War Room (1993) by DA Pennebaker and Chris Hegedus, tracing the Clinton presidential campaign in 1992 and using the cinema vérité style, is something Czech documentary film can still only dream about. Regrettably, no well researched documentaries on government and the people who govern are made in Bohemia today. This may be attributed to a persisting fear of the powers that be. Or perhaps it is not a prevailing trend of Czech documentary film which is more concerned with the life of the man in the street. It is no accident that the penetrating political documentary Out of Time (1999) was shot by Pavel Schnabel, a Czech-born film-maker who emigrated to Frankfurt in Germany in 1980. Schnabel chose the German rock musician Thomas “Monster“ Schoppe who fled the former German Democratic Republic and emigrated to West Berlin. The second character of Schnabel´s documentary is Professor Peter Porsch from Vienna who went the other way--from the West to the East. He admired communism and was happy living in it. Is there anything in documentaries that Czech film-makers can do better than anybody else? Are there documentaries in Bohemia that go to the heart of the problem? There are, but they are somewhat ironic and there is laughter in them. The talented Czech documentarist Jakub Sommer, son of the famous filmmaker Olga Sommerová, made a short documentary reportage Life At The Cemetery (1996). A young grave-digger speaks about how does it feel to dig graves, what does a white and gypsy funeral look like, and how people actually mourn. The film is accompanied by a funny Czech folk song about a grave-digger’s job. The protagonist says his son builds tombs at school. It is a bit funny and a bit sad, but first and foremost it is about the meaning of life. “Everybody is equal here,“ says the grave-digger about the cemetery. In regards to this particular philosophy, Czech documentary film is the cream of the crop. Radovan Holub is a veteran Czech journalist.